Made in Romania. Fabric: Rayon / Cotton. Marked: 38. Chest Size: 38. Category: Jacket. Color: Brown. Fee included above. Colour: Brown. Material: 100% Cotton. Size Guides. Size Guide. Neckline: Collared. Jumpers & Cardigans. Coats & Jackets. 15-16 Years. This jacket was bought in the late 90s. Fabric: 100 % Cotton. Size: 50 Italian. Shoulder Seam to Hem: 25". Waist: 43.5". Size Guides. Colour: Brown. Material: 100% Cotton. Size Guide. Neckline: Collared. Jumpers & Cardigans. Coats & Jackets. 15-16 Years. Coats & Jackets. Heart & Soul. Size Guides. Material: 100% Cotton. Colour: Brown. Size Guide. Jumpers & Cardigans. Suits & Jackets. LE COLLEZIONI. GIORGIO ARMANI. A fine corduroy brown fabric. A Blazer Jacket designed by. 100% Cotton. Size 40 R Regular. 33-1/4" from top of collar to bottom hem. 43" around chest. Stunning Armani Collezioni Trench Coat. 100% Authentic ARMANI COLLEZIONI. Care: Machine Wash Cold. Color: Dark Brown. Style: Four Button Closure. Sleeve (Shoulder to cuff): 25", Back Length: 35 ½". Underarm to Underarm: 22", Across Shoulders: 18 ½". Authentic Giorgio Armani Double Breasted Insulated Long Suit Coat. Designer:Armani Collezioni. Size:US 40. Equivalent Size:IT 50. We have an exclusive access to the world's best designer clothes at bargain prices. You may find unique designer pieces in our product selection that rocked the Fashion Week in New York, Milan and Paris! Futter aus Pelzimitat. Lederart: Kunstleder. Farbton: dunkelbraun. Obermaterial: 46% Acryl, 23% sonstige Fasern, 16% Polyester, 14% Baumwolle, 1% Polyurethan. AJ ARMANI JEANS. Größe: I L = L.
Designer:Armani Collezioni. This policy ensures that everyone gets proper recognition and makes the process a bit smoother for both parties. Size:US 40. Equivalent Size:IT 50. We have an exclusive access to the world's best designer clothes at bargain prices. Designer:Armani Collezioni. Equivalent Size:IT 52. Size:US 42. This policy ensures that everyone gets proper recognition and makes the process a bit smoother for both parties. We have an exclusive access to the world's best designer clothes at bargain prices. Designer:Armani Collezioni. Equivalent Size:IT 56. Size:US 46. This policy ensures that everyone gets proper recognition and makes the process a bit smoother for both parties. We have an exclusive access to the world's best designer clothes at bargain prices. Designer:Armani Collezioni. Equivalent Size:IT 52. Size:US 42. Italiano Fashion Inc. - Top Designers. We have an exclusive access to the world's best designer clothes at bargain prices. You may find unique designer pieces in our product selection that rocked the Fashion Week in New York, Milan and Paris! Designer:Armani Collezioni. Equivalent Size:IT 56. Size:US 46. Italiano Fashion Inc. - Top Designers. 46 10-12 L. 50 14-16 XL. We have an exclusive access to the world's best designer clothes at bargain prices. Designer:Armani Collezioni. Size:US 40. Equivalent Size:IT 50. Italiano Fashion Inc. - Top Designers. We have an exclusive access to the world's best designer clothes at bargain prices. You may find unique designer pieces in our product selection that rocked the Fashion Week in New York, Milan and Paris! Designer:Armani Collezioni. Equivalent Size:IT 52. Size:US 42. We have an exclusive access to the world's best designer clothes at bargain prices. You may find unique designer pieces in our product selection that rocked the Fashion Week in New York, Milan and Paris! Designer:Armani Collezioni. Equivalent Size:IT 56. Size:US 46. 46 10-12 L. 50 14-16 XL. We have an exclusive access to the world's best designer clothes at bargain prices. You may find unique designer pieces in our product selection that rocked the Fashion Week in New York, Milan and Paris! ARMANI JEANS COURDUROY JACKET. 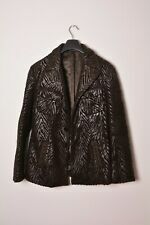 ARMANI JEANS COURDUROY JACKET in DARK BROWN Short Lenght. Top quality and confortable fit. 3 pockets on front. Resizable at the waist with buttons. Many details. Material: 53% POLYESTER 47% COTTON. Pockets - Lapel two brown stripes. Buttons Pockets - two Large. Buttons Three, front - Large black. Full length Front 77cm. Full length Back 76cm. Inside Sleeve 45cm. 60% Acetate. SHELL : 100% Polyester. Brown woven blazer. Shoulder to end of sleeve 26.5". Apart from this, it is a stunning jean jacket by Armani. Sizing Advice. This may include fading of the colour or small marks.